The Path to Violence premiered Wednesday, February 20, 2013. Learn what can be done to detect problem behavior and prevent violent attacks. Ever since the wake-up call that was Columbine, schools and law enforcement have developed multiple strategies to prevent attacks. Indeed, the horror of Newtown must be seen in a context that’s not defined by defeat. 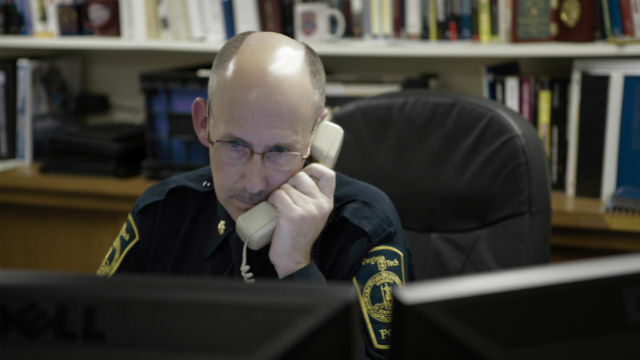 Gene Deisinger, director of threat management, on the phone in his office at Virginia Tech. Photo courtesy of Stephen Harrison. More than 120 school assaults have been thwarted in the past ten years. And remarkably, while security hardware and physical barriers can play a deterrent role, it’s been psychologists — working hand in hand with law enforcement officers — who have come up with the most helpful tools to prevent violent attacks. The Path to Violence tells the story of a powerfully effective Secret Service program — the Safe School Initiative — that’s helped schools detect problem behavior in advance. But despite the progress made, recent attacks have revealed a gaping hole in our safety net. Adam Lanza, Jared Loughner and allegedly James Holmes all executed their attacks after they’d left their respective schools. Here parents may be the only line of defense — parents who are terrified of their own children. Can the hard-won gains made by psychologists and law enforcement be extended to the families of some of the nation’s most violent individuals? Is the country ready to have a national conversation about the balance between safety and civil liberties that such interventions would require? The Path to Violence was produced by JWM Productions.